The first Wyndham Gardens hotel is expected to open May 2018 at Queenstown’s Remarkable Park. Wyndham Hotel Group is to build a second hotel in Queenstown’s Remarkables Park area. 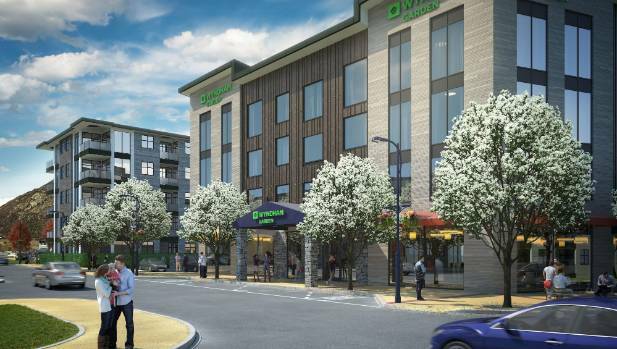 Close to the airport and two snow fields, the 75-room hotel is slated to open under the Wyndham Gardens brand in May next year. The group, which has 110 hotels around the world, has been rapidly growing its footprint in New Zealand, and now runs 10 hotels here. They include a $50m Wyndham Gardens proposed for Auckland and a new $15m 77-room Ramada Encore hotel in Christchurch just announced this month. Wyndham’s South East Asia and Pacific Rim managing director and president, Barry Robinson, said the Queenstown project was being driven by surging demand for hotel rooms. Developer Safari Group has already built four Ramada hotels for Wyndham, including the one in Remarkables Park. “We anticipate strong interest in the serviced apartments we are offering,” Safari Group director Robert Neil said. Colliers hotel specialist Dean Humphries said most hotels were bigger and owned by one entity, but Safari was following a different model which involved selling individual rooms to investors on a strata-title basis.